The AV5400 is Avision's next generation of A3 document scanner. Based on CIS (Contact Image Sensor) technology, the scanner is much slimmer compared to traditional scanner with CCD design. The AV5400 supports paper up to A3 size. Yet, it is also a fast scanner. 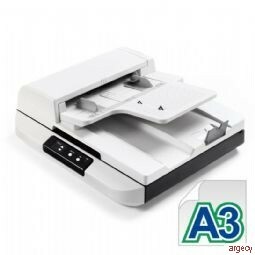 With the 50-page auto document feeder, the AV5400 offers high scan rate of up to 50 pages per minute and 100 images per minute (B&W, 300 dpi, landscape). The 50-page auto document feeder is also robust enough to feed paper in size between 5.8" x 8.3" and A3 (11.7" x 16.5" ) and in weight between 60 g/m2 (16 lb) and 105 g/m2 ( 28 lb). In addition, the scanner comes with the convenient feature of multiple images cropping. With this feature, various sizes of documents such as photos, ID Cards, or business cards can be placed on the flatbed and the scanner is able to crop and create multiple images according to the original sizes in one single scan. The AV5400 delivers high throughput and outstanding performance. However, it is earth-friendly at the same time. The LED technology requires no warm up time and is lower power consumption without generating mercury vapor as other traditional scanners using the CCFL (cold cathode fluorescent lamp) technology. The AV5400 come with TWAIN and ISIS drivers, and are bundled with a suite of powerful software applications that include Avision Button Manager V2, AvScan 5.0, and ScanSoft PaperPort 11SE. With Button Manager V2, you can scan to searchable PDF, JPEG, BMP, or GIF file format, save to folder on your computer, and scan to e-mail, image editing application, or a cloud application such as Google Docs or Microsoft SharePoint with a press of a button. The AVScan V5 and ScanSoft PaperPort are highly effective image processing and document management software that helps you streamline your task more efficiently.